Ah, Black Friday, how you are spoiling us! Not only did the discounts start on Wednesday (yes, you can see the chicest pieces in our list of the best Black Friday clothing deals here), but also we discovered that the cult-adored rainbow-stripe Gap jumper we've been following via its many adventures on social media now is 40% off. Big. News. Cometh. As you can see from the many British influencers below, the brand's Crazy Stripe sweater has quite the fan club. Whether tapping into the booming rainbow trend or favoured as a grown-up alternative to the Christmas sweater, this natty little knit has had no shortage of exposure. Which is why the reduction in price is to be taken seriously: This—or its knitted siblings—will not wait for anyone. Keep scrolling to see how other girls are wearing their sweaters, and shop it for yourself. 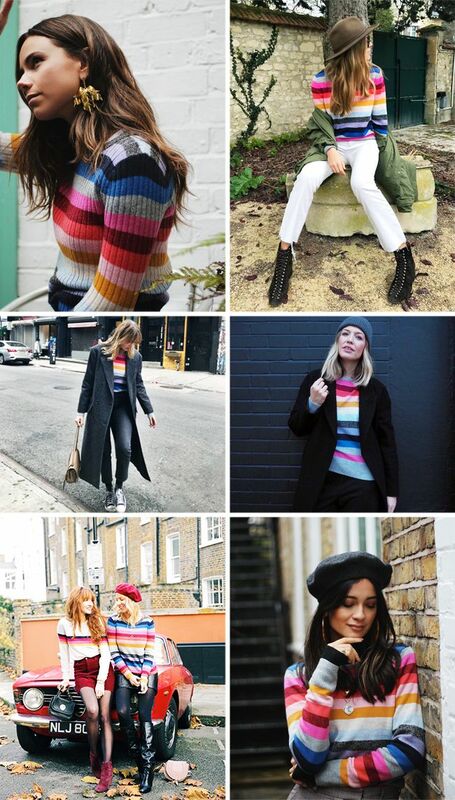 Clockwise from top left: Florrie Thomas of & Finally; Monica Ainley; Alexis Foreman of Style Memos; Anna Vitiello of & Finally; Alice and Hannah of Belle & Bunty; Lizzie Hadfield of Shot From the Street. Next up, the coolest ankle boots to buy now.